Many or all of the email services as well as social networking websites have restricted to upload any sort of the executable file format such as .exe or .bat files. Because these files are considered to be as a security threat to the system. You can't even upload a compressed file such as zip which contain executable files. So I have posted two ways to send almost any file format that are restricted by email providers or by social networking website. 2. Just upload the file which you want to share with friends. 4. Share the link with your friends so that they can download and make use of file. 1. Go to the directory where your file which is to be send is located. 2. Press shift key and right click, select Open Command window here to open the Command Prompt. -filename.exe will be your file with any extension. 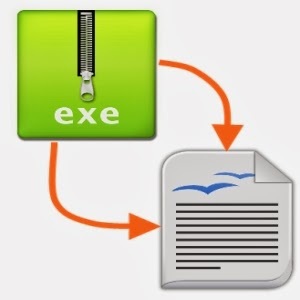 -filename.txt is the name of output file with the extension to which you want to convert. Here it has .txt as extension. 4. You will get the file with specified extension. Just upload the file through mail or from social networking websites. What the receiver of file should do to get original file? Note that you should apply same extension that the file was having at the time of sender was sending. Here in this case it's .exe. Using this method you can change any file extension to any other extension.